The IGX 2016 Longsword and Mixed Weapons Tournaments are using the same ruleset as the “IGX 2015 Modified Nordic League Tournament Rules” with some minor adjustments to judges’ calls. Actions in which effectiveness comes from joint injury, such as small joint manipulation, full arm bars, and kicks to the knee. Punching. The use of the open hand to push during wrestling is permitted. 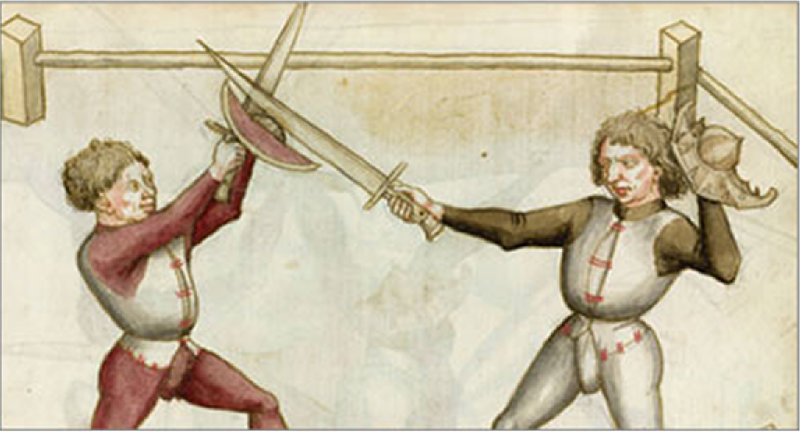 In any Mixed Weapons tournament, buckler punches are not permitted. While a valid action, it is too likely to cause a concussion. Pommel strikes to the top or back of the head. Strikes to the groin or to the back of the head. Push kicks above the belt are allowed; all other kicks are not. Anyone who sees other safety issues, such as loss of equipment or antelope running across the ring, should immediately call halt. Time will resume once the issue has been remedied. Bouts will take place on a circular ring, approximately 10m in diameter on indoor turf. No skin is allowed to show. No open-toed shoes or bare feet allowed. 5-toe shoes are ok.
A strike must be with the sword edge, point or pommel. Pommel strikes are allowed only to the grill of the mask. A slice must travel across the target and push against the body or limb such that it is moved. A pommel strike to the mask must travel at least two inches and have the arm behind it – we are looking for a pommel “thrust,” not a sideways backhand pommel. 2 points for cuts/thrusts to the head and torso. The torso includes the shoulder and extends to the bottom of a standard jacket. 1 point for cuts/thrusts to any other area of the body (except groin or back of head/neck – do not deliberately target these areas). 1 point for pommel strikes to the mask. Throws with dominance: 2 points. Dominance requires either remaining standing while your opponent is down or ending the throw on top and in control. Throws that do not clearly demonstrate control will not earn a point or count as a pass unless there was another scoring action. Down shall be considered “three points down,” i.e., two knees and a hand on the ground, shoulders and hips, etc. Special note: If you trip or otherwise throw yourself while your opponent remains standing, even if he is across the ring scratching his head, he will be awarded the 2 points without having to unsafely fling himself on your prone body. Stay on your feet. Ringouts: 1 point for the fighter remaining in the ring. If both fighters exit the ring, this is a non-scoring pass. A fighter is not out of the ring until both feet are completely outside of the ring boundary. If you are falling outside of the ring and hit your opponent after you are out, that strike does not score. The FIRST scoring action by EACH fighter that occurs before “Halt” is called will be counted. If a fighter scores twice before “Halt” is called (for example, a strike to the arm and then the head) only the first strike scores. If one fighter lands a strike and the opponent does not, that fighter’s score is DOUBLED. The Clean Hit Bonus will not be applied in cases where one pair of judges cannot determine if their fighter landed a strike (“Abstain,” see Staffing/Judging below). The Longsword and Mixed Weapons Tournaments will be held in 3 stages: a qualifying stage with pools, an eliminations stage with pools, and a single-elimination finals stage with the top 4 contenders. A pass ends when one or more fighters scores a point. Any scoring action counts as a pass, whether it is a strike, throw, disarm, or ringout. If “Point” is called but no strike counts for either fighter (“nothing done”), it does not count as a pass. Note on round length: with only six passes, making good use of the round to score is important (see Scoring/Ranking above). Ten points is obtainable in three passes at best; 2 points doubled by a Clean Hit Bonus makes 4 points the best possible pass. After each exchange, when “Point!” and then “Halt!” are called, each pair of judges will confer to determine what action they saw THEIR fighter complete and what target was struck, if any. A judge pair must be unanimous in their call. The judges conference should not take longer than a few seconds; Judges are allowed to confer with the Referee if necessary. 0 points – Judge forms a “0” with his fingers to indicate his fighter did not land a successful strike on the opponent. Note: If both pairs of judges show 0 points, the pass does not count toward the 6 pass maximum and the pass resumes. 1 point strike – Judge raises one finger to indicate his fighter landed a successful strike on the opponent’s arms/legs, or a pommel strike to the mask. Ringout – Judge points to the ring edge while simultaneously raising one finger to indicate his fighter executed a successful ringout on the opponent. 2 point strike/disarm/throw – Judge raises two fingers to indicate his fighter landed a successful strike on the opponent’s head/torso, successfully executed a disarm, or successfully threw his opponent with dominance. Abstain – Judge crosses both arms in front of his face to indicate he could not tell what action his fighter completed. If one pair of judges “Abstain” and the other pair of judges indicate points, the fighter who receives points will not be awarded the Clean Hit Bonus. If both pairs of judges “Abstain” the pass does not count toward the 6 pass maximum and the pass resumes.